Who’s ready for a yoga happy hour?? Just in time for warm weather and springtime fun, we are bringing back outdoor yoga to downtown!! 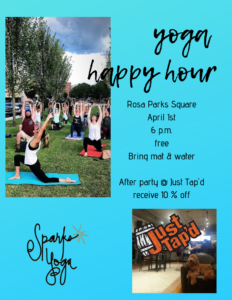 Join us in Poplar Park on April 1st @ 6 p.m. for FREE yoga!!! This class is all levels and all ages, so bring your friends and family!! Walk over to Just Tap’d for the after party and receive 10% off! !